I can't begin to tell you what a pleasure it is to look at my blog at the end of a tough day and find comments from you regarding a post. Your thoughts make me stop and think, sometimes laugh aloud, and frequently do a little further investigating based on the links and ideas you offer. I often read your posts aloud to Todd; it's just so fun to hear/see what you have to say! Thank you very much. Your feedback makes the time and effort of blogging very worthwhile to me, and I really appreciate hearing from you. Today I had to be up in the garment district to pick up some odds and ends. 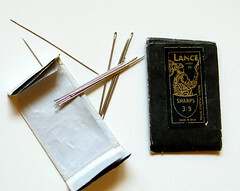 Few things are more difficult to find in New York than sewing notions. (Ok, maybe I exaggerate. There are a handful of items more difficult to find: friendly grocery cashiers and convenient public bathrooms come to mind. But back to my point.) In the rest of the country, when you go to the fabric store you can buy fabric, sewing patterns and notions all in the same place. Not here. Here fabric stores carry fabric. Rarely patterns, no zippers, no thread. Way back in the old days, when we first moved here, Woolworth's was still in business. They didn't have a fantastic selection, but you could find thread, zippers, buttons, and a few additional sewing accountrements there. When they closed I was lost. It took a little research to find my way to Steinlauf and Stoller. 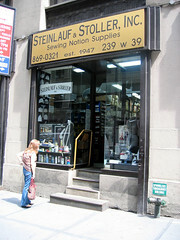 Steinlauf and Stoller is one of very few notions suppliers in the Manhattan area. They provide much of the garment industry, especially design houses with sample rooms (a rare luxury in this day of overseas development and production), with notions and supplies. Walking into S&S feels a lot like moving back in time. This is not glamorous shopping; the walls are lined with dusty metal shelves which are filled with small cardboard boxes holding the necessities. Zippers are kept in boxes sorted by color and size; rummage around in a box labeled "Eight inch invisible zippers: Blue" until you find a navy zipper similar to the color you are trying to match. Rolls of pattern paper can be found poking out of a cubbyhole toward the back of the shop. If you wait your turn, one of the men (and occasionally a woman) behind the counter will assist you with bra hooks, boning (used for fitted garments, especially strapless gowns), snaps, shoulder pads (yes, indeedy!) and other bits. And at the very front of the store you'll find a woman working an industrial machine that sets grommets and snaps on clothing, especially on denim and leather. If you stay and watch for a while, you'll see employees from some of the fashion houses drop by for sample room supplies. Someone might bring in a jacket that needs snaps before a photo shoot or a fashion show. Another person may stop to pick up a large boxes of pins or to have their scissors sharpened. Students also purchase their supplies at S&S, and occasionally you'll find someone who sews for fun. I sometimes wonder how much longer little shops like this can survive in New York. S&S clearly does a lot of business, but the crazy, dilapidated old cavernous trim shop on Broadway in SoHo closed a few years ago (Oh, what stories I can tell about that place! Once I requested hem tape, and the 98-year-old man behind the counter rummaged around in a box behind him, handed me a knot of multicolored bits that had been sewn together, and said "Here you are" as though he was offering me a brand new package of the stuff. Huh? In order to use it I had to separate the red from the green tape with a seam ripper. That's old-fashioned New York customer service for you. ), and outrageous real estate prices combined with a trend toward more upscale retail shopping (including a little bit of attention given to retail display: whoa!) will continue to make business more and more difficult for the old stalwarts of the business. Would I miss S&S if they went out of business? Sure. There aren't many other options for sewing notions in this city, and the character of the place adds interest to my shopping experience. I like shopping locally and supporting small businesses. I'd just as soon not shop at a big chain like Joanne Fabric for my notions. On the other hand, I'd love to have something closer to our neighborhood, or something with a little more attention given to new products in the market. You won't find a rotary cutter at S&S, that's for sure. But where else could I have my giant sewing scissors sharpened? And what would be missing from my life if I didn't receive a hand-written receipt for my purchases? As idiosyncratic as Steinlauf and Stoller may be, I'd hate to lose that connection to the old New York. Especially since I can't buy used hem tape on lower Broadway anymore. I'm a Brooklyn sewer/knitting chick/crafty lady too, and I enjoyed your post about S & S. I'll make sure to check it out sometime. My loyalty is to P & S Fabrics down on Broadway near Franklin in Tribeca. First, I love that it's in Tribeca, of all places... this semi-dirty, gritty little sewing shop. I love that they have everything I've ever needed for a project when I approached them - interfacing, yarn, a dark green 17" zipper, chinese brocade. And I love that the guy behind the counter fully encourages me to come behind the counter myself and search for the knitting needle sizes I need, which are stored back there. I've been mistaken for the help at least twice. In short, I agree with you... New York sewing stores are a treasure! I love a trip to Joann's when out of the city, but I hope it never comes to that here! It's very nice to comment on your delightful site because you have wonderful posts! Ahhh, fabric stores and the fashion industry. I am feeling so nostalgic now! I hope you had a wonderful shopping trip! Like knittingchick, I've also only gone to P&S - which is great, because like you, I've found that there is hardly any "one-stop shopping" for sewing in nyc. They have patterns and fabrics and notions and a pretty decent yarn selection. I'd love to check out S&S, so thank you for posting this - I will definitely take a look! Hi there! Thanks for the info on this shop... I have heard tell of the lady inserting snaps in the window, but never knew just where that was. I totally agree that NYC is impossible for notions. I get mine up on 57th Street at Greenberg & Hammer. A really anomalous place to find a dusty notions store, right across from Bergdorfs. There are several fabric stores off the Fulton Street Mall in Brooklyn--definitely at least two on Bridge St. They have more standard fabric store-style notion selections, nothing fancy, and at least one of them carries patterns. I love S+S too, but it's handy to have a less idiosyncratic choice as well. Thanks so much for the tip! I'll definitely check out S&S soon. I remember the trim shop in Soho too and was so sad when it closed—I loved just going into the shop and walking through all the dangling bits of ribbon—it was like stepping back in time. ah... it sounds like the grown-up version of the haberdashers of my childhood. Of course these no longer exist, and I still mourn. the drawers of buttons and trims are probably the main reason i (eventually, after some minor detours) became a designer. In London we still have Kleins for garment trade haberdashery and MacCulloch and Wallis for everything else. Neither is glamourous, but both wonderful. Long live the specialist shop! Where I live the only place you can really find anything is Hobby Lobby, its run all the mom and pops out, just like Barnes and Noble and most of the chain grocery stores. When I visit NY city this is something I always think about because even though its one of the largest and most progressive cities in the world it still has a real homey, old time, feeling because of all the unique neighborhood shops! By the way I'm new to your site and I love it, it looks good and I love all your ideas. wow...reading your post made me remember my ny fabric days. it was like reading about my own trip to S & S. i'm all the way on the other coast now, but i still think about all the *delights* of ny. also it was quite a surprise to see a reference to Woolworth's! i was just talking about them and wondering if there are any still open? i am now on a quest to find a store! I love reading your blogs about Manhattan--it's so amazing that a city like that can still harbor such old world places! It may be a bit of an inconvenience but still somewhat refreshing compared to suburbia with its strip malls containing all the same stores and eateries! I have such fond memories of living in Florham Park, New Jersey and the quirky places you get used to. Liesl, Your post bought me back to my childhood days. I grew up near a Woolworth store and it is where my mom bought things to introduce me to sewing, embroidery, cross stitch and other craft hobbies. Before the store closed, I used to go, browse & dream of the things I'd make during my summers. Thanks for the tip for S&S! I typically go to P&S Frabrics, but S&S is closer that I can make trips during my lunch hour. I'm glad many of you mentioned P&S. I've only recently rediscovered it; it's the closest thing we've got to a "regular" fabric store, with notions, patterns, yarn, and trims. Even embroidery floss! Thanks, all, for your comments. That crazy place on lower Broadway is still around, it just relocated to Williamsburg! Don't worry, the new place is equally decrepit and atmospheric. A lot of the old guys are there, too. It's on Grand Street between Driggs and Roebling, a short walk from the L or the J train. So hearing you on this! I remember going to S&S for a zipper once when I lived in New York (before I moved to Oregon). Your description is spot on--it really makes me miss the grit and character of that city. I'm going to visit Manhattan again soon, and I look forward to more fabric shopping there. Care to share your favorite haunts? As for convenient bathrooms, I remember keeping a mental map of all the Barnes & Noble stores in Manhattan--just so I could stop to use the loo! Isabelle, I can't believe they actually had enough energy to pack up and move that place! Those little old men and all that dusty old trim. I will absolutely make a visit to the new (cough, cough) digs. Thanks for the tip! First of all I am glad to find a community of sewers that love talking about the pre-design/sewing gathering process. I have been looking for this place. I just called my girl Ya ya who lives in w'burg and asked her if she knew where it was. Thank gawd I googled it and found you all. Thank you again. I have been looking for that place for years! My first visit to NY found me in ribbon and trim nirvana where I suffered from sensory overload. The counter man mocked me when I finally recovered the motor skills to select a ribbon and request a cut. "2 yards? 2 yards, she says!" The cat ignored me and the other guy just walked away. I was out of my league but have since embraced many more ribbon and trim endeavours and NEED that store! Anyone know the NAME of this treasure?